You can enjoy this high protein kick-off to the day with any herbs you find tasty and healthy. 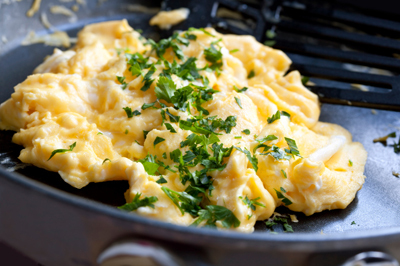 For a generally nutritious scramble, try parsley, but it’s also delicious with chives, dill, basil, or cilantro. Blanching the herbs for one minute keeps them bright green if that’s important to you. Bring a medium pot of water to a boil over high heat. Add the parsley (and any other herbs) and cook for 1 minute. Drain and rinse under cold water. Whisk the eggs in a medium bowl. Add the parsley, salt, and several grinds of pepper and whisk to combine. Warm the oil in a large nonstick or cast-iron skillet over medium heat. Pour in the eggs and stir gently and constantly until the eggs form large curds and are cooked to your preference, about 2 to 3 minutes. Serve immediately. Per serving: Calories 149; Fat 12.6 g (Saturated 3.8 g); Cholesterol 420 mg; Sodium 178 mg; Carbohydrate 3.2 g (Fiber 1 g); Protein 6.3 g; Sugar 0.4 g.